Are you struggling to keep pace with ever-increasing workloads on a never-increasing budget? While virtualization has provided some relief by enabling the benefits of faster deployment and consolidation, it tends to put additional stress on data center networks. The HP SN6000B Fibre Channel Switch meets the needs of hyper-scale, private cloud storage environments by delivering market-leading 16Gb Fibre Channel (FC) technology and capabilities that support highly virtualized environments. Designed to enable greater flexibility and investment protection, the SN6000B switch scales from 24 to 48 ports and supports 4, 8, 10, or 16 Gb/s speeds in an efficiently designed 1U package. It also provides a simplified deployment process and a point-and-click user interface making it powerful and easy to use. It offers low-cost access to SAN technology while providing "pay-as-you-grow" scalability to meet the needs of an evolving storage environment. The HP SN6000B Fibre Channel Switch provides high speed 16 Gb/s optimized inter switch links (ISLs) providing twice the performance as previous generation Fibre Channel switches. The net result is there are fewer links, fewer cables, fewer ports and less power for the same performance. Delivers 128 Gb/s high-performance, resilient frame-based trunk. Preserves ports for server and storage connectivity and scales from 24 to 48 ports. 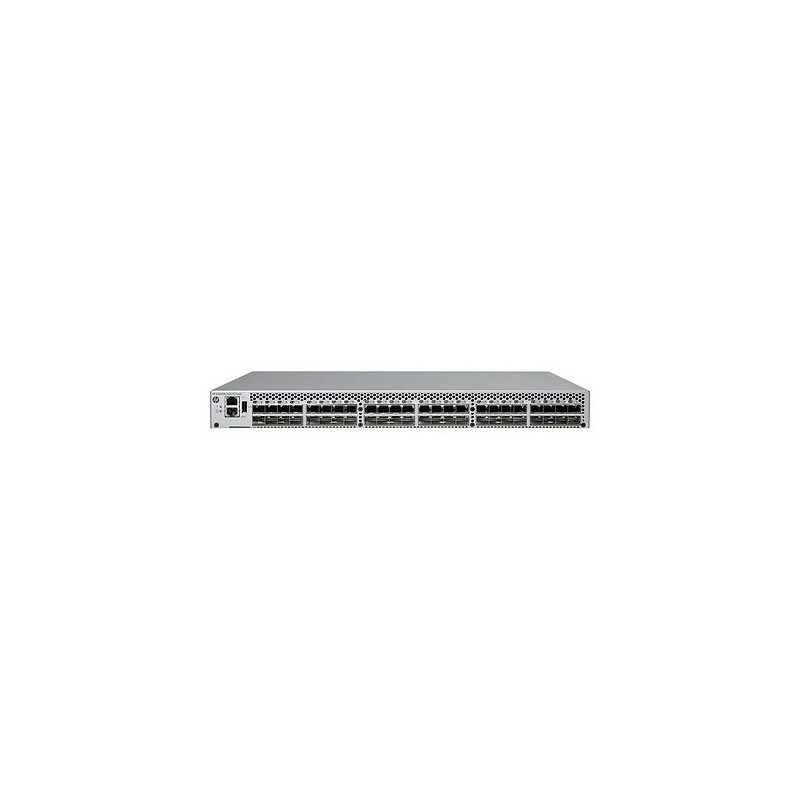 The HP SN6000B FC Switch offers operating speeds of 16, 10, 8, and 4 Gb/s offer a wide range of performance for long distance connectivity. Operating the port at 10 Gb/s is also supported over Wave Division Multiplexing (WDM) solutions, such as Dense Wave Division Multiplexing (DWDM). Integrated Inter-Switch Link (ISL) Compression provides the capability to compress all data in flight, over an ISL which gives you the choice of either moving more data or reducing bandwidth costs. Integrated Inter-Switch Link (ISL) Encryption provides the capability to encrypt all data in flight, over an ISL. Both encryption and compression can be enabled on the ISL link simultaneously. Enabling ISL encryption results in all data being encrypted as it is sent over a link for added security. The HP SN6000B FC Switch provides Diagnostic Ports (D_Ports) that enable administrators to identify and isolate optics and cable problems, reducing fabric deployment and diagnostic times. Use D_Ports to run a variety of tests for ports, SFPs, and cables for faults, latency, and distance. SAN Network Advisor, offered as an option, provides comprehensive management of data center SAN fabrics, including configuration, monitoring, diagnostics, best-practices validation, and management of B-series Directors, Switches, and Host Bus Adapters (HBAs). The HP SN6000B Fibre Channel Switch provides aggregate 1536 Gb full-duplex throughput and any eight ports can be trunked for 128 Gb Inter-Switch Links (ISLs). Exchange-based Dynamic Path Selection (DPS) optimizes fabric-wide performance and load balancing by automatically routing data to the most efficient available path.